Okay! 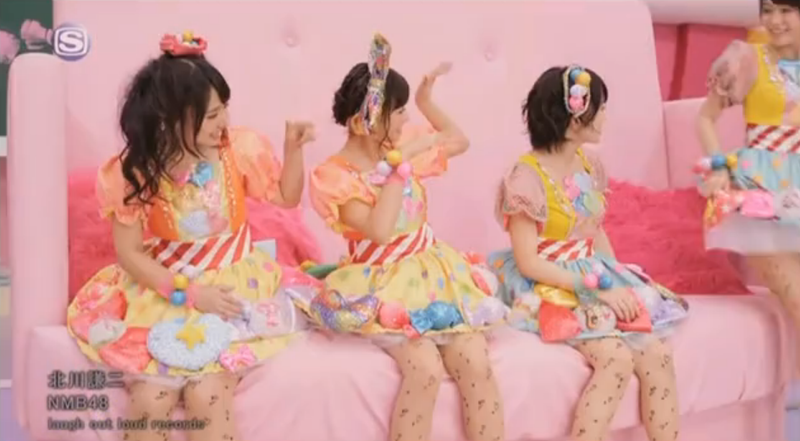 Musume Time: It's Time for some Halloween Candy with NMB48's 'Kitagawa Kenji'! It's Time for some Halloween Candy with NMB48's 'Kitagawa Kenji'! All thoughts and opinions within this blog are my own! Whatever I think or feel about a group, their song or PV is my opinion only, no one else's. If you do not like my opinion, that is totally fine by me, but just because you don't agree with me doesn't mean that you should try to make me think differently. I want to share my thoughts and feelings about this video, so respect that. Thank you. ... It's as if Kyary Pamyu Pamyu and Michishige Sayumi's Sayuminglandoll came together and puked on top of NMB48 to create this candy-tastic PV. Yes, it is that sweet and cavity worthy. Halloween is truly around the corner, is it not? You know, it is rather weird jumping from the spectacular Halloween Party PV to this piece of candy-induced love and Jpop Idol genericness, but hey, this is my first NMB48 PV review in a while, and considering I actually like this song and PV this time around, I thought that it would be nice to bring the girls back to my blog and have a chit chat about them all with you. What do you say? So, get ready to bring out the costumes and your Halloween bags, because we're going Candy hunting with NMB48's sweet and tasty Kitagawa Kenji. Time to hunt down those treats from your neighbours! You know what, this opening reminds me of Namida Surprise. What about you? Are YOU the rumoured Kitgawa Kenji? ... The face says no, I say yes. I'm waiting for the foot tapping, note throwing and general all around gossiping whilst someone sighs dreamily as they think about Kitagawa Kenji. Yeah, I fall asleep during Math lesson too - you're not the only one girl. And Kenji, put that ruler/cane away! These girls are too young and pure for you to be wanting to whip! Ooooh, girls are getting their claws out! Meow! Guess what? 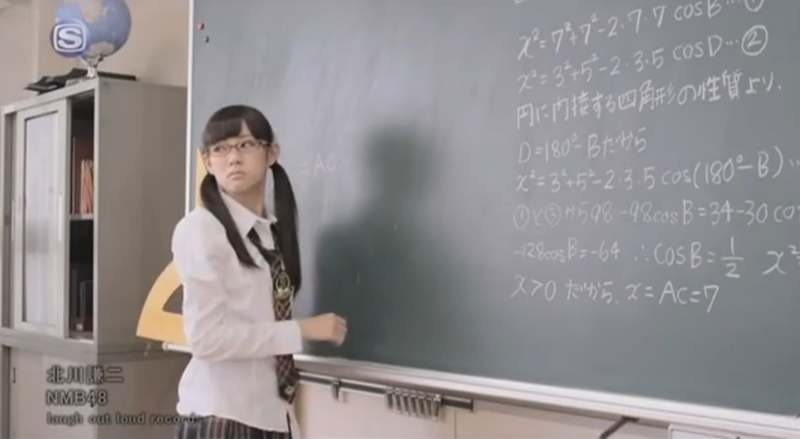 That girl is basically me when I had to go up to the board and write out the answer to even the simplest Math question. ... But I'm not as cute, and I am certainly not an Idol. 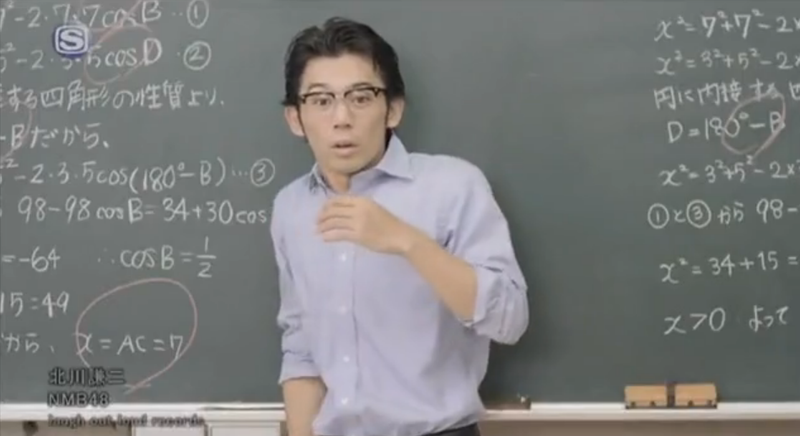 Doesn't every equation come to an Idol group? ... Wait, they're robots now!? Oh my lord, I knew it, NMB48 are manufactured! Hence why they are so bloody boring! ... Kyary has definitely been here. I can see bits of tacky everywhere! Okay, so can I put these girls in my Halloween bag and take them home? They look like candy! ... I want it! I want it NOW!!! They look so cuuuute *^* I just want to steal them ALL!!! Literally walking over a person... kinda. Yes, yes I will kiss you if you be my candy piece this Halloween. I really am enjoying these props! It's like a giant house with Thumbelina's or Borrowers running about in it! ... Wait, is this The Borrowers inspired? Being all happy in class is something that no one experiences... especially if it's Math class. I needed to cap this cos it was too cute! I like the eyelashes they have used, and this girl is absolutely stunning! Cuties: "We are Candy, please take us home for Halloween!" I will gladly take these candy pieces home, who wouldn't!? Are you looking for a new home too, little miss Candy piece? Those costumes make me want sweeties D; not good, guys, not good. She's hugging something long and hard, and looks very happy. Wait, the Candy pieces made it into the classroom!? I thought that you were all in my Halloween bag!!! Continuity error, Kenji was all the way at the back before, so why is he in the middle now? Happy candy pieces are dancing around because they have all found new homes! Nom time! Kenji looks extremely shocked. Why, Kenji? What has happened? ... Ah, they turned into Candy pieces for your pleasure. Don' be so shocked, man. They are nommyful, I promise. Okay, so admittedly this PV is not on par with the epicness that is Halloween Party, and neither is the song, but this is the first song and PV in a long time which has given me a reason to get interested in NMB48 again, and honestly, I do really like the video, so despite the lack of plot and epic visuals or set, I think that this is a really nice, simple MV from NMB48. 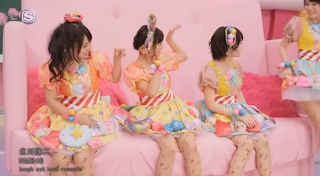 Basically, this is your typical candy-fueled Idol pop video with a generic sound to it, but it's entertaining and tame enough to make sure that you don't hate it like I hate Pon Pon Pon. It's cute, quirky and over-the-top bubbly with a good amount of happiness and random love which makes the generic Idol world go around. 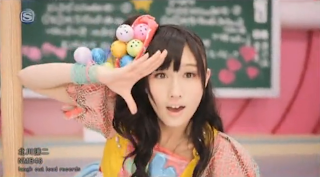 Anyway, this is a really cute PV. It opens up with a rather Namida Surprise like sequence, with the girls sitting in the classroom, looking bored and tired and, in general, bland. 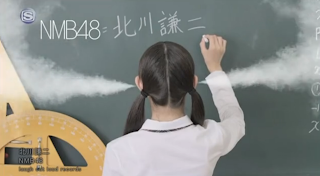 Of course, I hate this opening sequence - I see little to no relevance for it, but then again this is a 48 group - they need to start off a video with a pointless opening to show off the girls in uniforms. I swear, that's the only reason it is not there. Unless they really wanted to pin the teacher as Kitagawa Kenji, whom the song is named after. Doubtful though. The rest of the PV, though, is colour and sweetness galore. The girls basically run about in adorable costumes made of plastic and cushions, dancing around the set, eating tree's, climbing on giant pieces of furniture and hugging cushions. It's adorable, and the girls look happy, which makes this video quite happy too. I'm not complaining, really, because the lack of plot is made up for with the use of how adorable and happy the girls look. They really rely on the girls for this performance wise, because there really is nothing else going on other than the girls having a blast and posing for the camera. It's great that their happiness seems really genuine, which is a bonus for these sorts of videos. 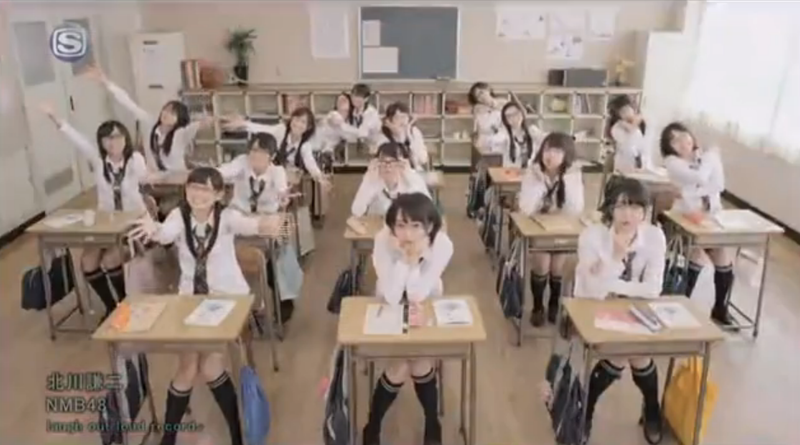 Other than the general cutesy, pink-infested parts of the PV, we also get scenes with the girls in the classroom, showing off their boredom and how enthusiastic they are during lesson. These scenes are okay, though not really relevant to the video if it wasn't for the beginning, but I do like how they tied in the girls going from School girls to candy-loving Idols. It's as if the girls are in a daydream together, thinking up their own little fantasy world where they are having fun and enjoying life with cutesy dances and fun-coloured walls as opposed to the dull reality. Ah... I get it now. It's basically the girls going from daydream to reality. Now I see why the whole thing ties in. Took me a while, didn't it? Anyway, the other scenes show the girls boredom and how they fantasize about something different from their dreary day-to-day classes, and how it eventually leaks into reality with the girls' daydreams escaping and allowing the girls to embrace their fun side, which in turn freaks the hell out of Kenji. It's cute, I think, and I actually like this concept now. There seems to be more to the PV than I thought, other than generic Idol cuteness and a chance to make money. It is a very cute PV. The colour and sweetness make it really appealing for me, and it gives a happy feeling to the viewer. I found the girls quite appealing in this video, it allowed me to fall for their random antics and how adorable they all truly are. The scenes are well shot, and I like the feeling of the girls being smaller than the objects around them, it gives a rather Thumbelina like quality to the whole video. The dance is also a favourite part of the video for me. It's cute, energetic and fun to watch, and really makes me want to dance with the girls. It's simple, but it fits the sweetness of the video and the song and isn't too over the top. 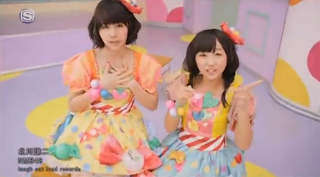 Everything is so happy in this video, from the generic sweet poppy Idol song to the colourful and sweet PV which makes me think of candy and cuteness. It's like watching Kusumi Koharu's Chance PV all over again, except cuter and with more girls to look at. It's very nice to watch I think, and if you like anything cute and girly, then you should take a look at this video and see if you like it or not! ... It's honestly really nice to actually like something by NMB once again, even if it is one of their more generic songs. So which girl will become your favourite Halloween treat? "I like the eyelashes they have used, and this girl is absolutely stunning!" ---Erm you comment here...I don't know if you realised but that's Fukumoto Aina/Ainyan! LOL. Also about Kitagawa Kenji, actually what NMB is great at are facial expressions. Whenever this song is performed, I look forward to that the most, and how the girls can just go crazy and whacky performing this. Especially when Team N perform this song in theatre. they're insaneeee!! It's almost like a freestyle song where they can just fly off and go mad haha. Well I was formerly an AKB fan from late 2010...(I say formerly cause I'm not really into AKB anymore), and I have since jumped ship to NMB somewhere right before NMB's debut single in June 2011. Haha it's been 2 years now. So if there's anything AAA-related or NMB-related that you want to know, feel free to ask me hahaha. This song does seem very freestyle, even the dance at times looks more free than most choreographies. I think that's why I like it; it's very bubbly, energetic, and carefree to the point where the girls just enjoy it and do whatever! These peformances sound good, too! ... Maachun. My friend on Facebook is a biiiig Maachun fan! She always posts pictures of her! Ooooh, well I can understand jumping to NMB, from what I do see of them right now, they are a splendid group with amazing talent! I admit, not all of their singles appeal to me, but I have really started to enjoy them as of late since Kitagawa Kenji! Lol I'm gonna get confused if I reply to you in too many places.
" And aaah, so NMB are the comedy group of the 48's? This is why they are getting their own comedy movie then, I assume?" Yepp they pretty much are. It has to do with the management. While AKB, SKE and HKT are all under AKS, NMB are the only ones where all the girls are managed by Yoshimoto (this HUGEEE really old comedy-based company). It's an amazing management to have because it basically secures all their spots on TV because Yoshimoto basically has manipulation over literally all the TV varieties in Japan because it's the field they're the most known for. 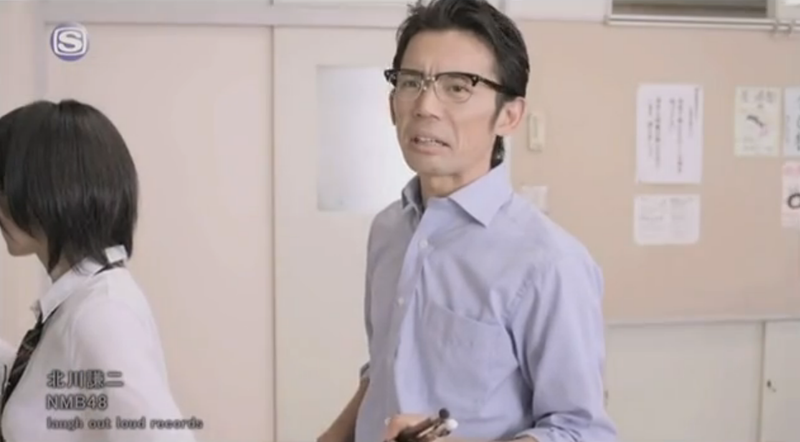 All the famous comedic talents are from Yoshimoto, hence NMB has tonnes of exposure with these dudes. And yeah also cause of the Yoshimoto connection, they got a comedy movie. While giving credit to their management, obviously they wouldn't be popular in their homebase if they weren't actually interesting/funny themselves. Geographically, NMB are from Osaka, and that's like the land of comedy. NMB were expected to live up to the standard of idols who can be comedians from the start. If not, the group wouldn't survive. Cause that's just how their locality is. Also, I noticed on YT, we were talking about B-sides. Well perhaps I should introduce you to some of my favourites. This was the song I was talking about from the Omaiga single. It was also ranked #1 at NMB's RH. (though that was mainly cause Ainyan was gonna graduate soon, and she stated in the past it was her favourite song. Fans wanted it to rank #1 I guess kinda as a farewell gift of sorts. it was really sweet.) Other than that, it's a really nice song, vocalwise and it's fairytale like haha. I find it highly interesting that NMB seems more comedy-based when compared to its sister groups; it really does seem that NMB have more personality, right now XD I also like how their locality plays a major role in how they are seen and produced; it makes them pretty unique, in a way. Well... to me it sets them apart from the rest of the AKS franchise. Ooooh, Dazai Osamu wo Yonda ka? sounds quite country! I like it XD -quite likes country pop-. It's really refreshing to hear, actually! A very nice song, the vocals are also quite pure. I can see why you like it! Wait... I have watched Kesshou before! When I saw the opening I was just like '... Yeah, this is the song with the rabbit in' XD it reminds me of Alice in Wonderland, in a way. As you say, it has a fairytale like quality it. Hmms, cute, sweet, bubbly generic song. Yepp there's this one NMB B-side you must check out. No sayanee but it's a good song lol. 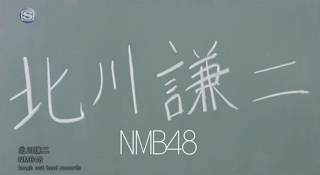 This is the akagumi song, a B-side from NMB's 4th single, Nagiichi. I really really like this song. Do you know how there's sometimes some songs that can give you warm and fuzzy feelings inside? This song is like that for me. It's cute but not overly cutesy. It's just the right balance. And the PV is great for this. The colour schemes go well with the whole thing. Comedic stuff too hehe.It somehow gives a warm feeling to my heart. 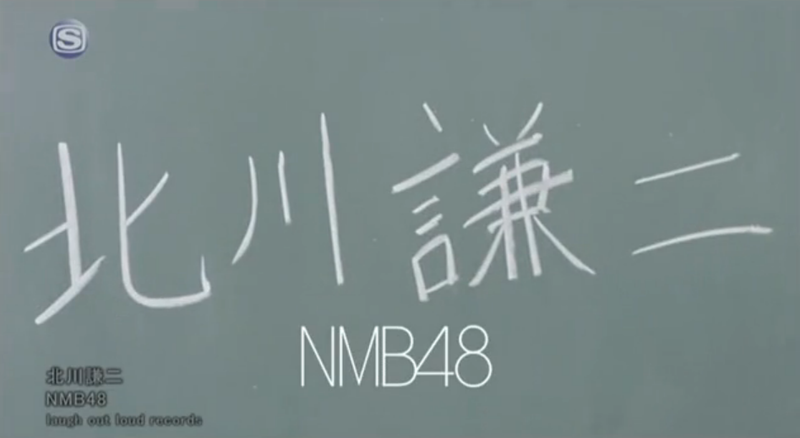 Contrary to popular belief, NMB's first song isn't Zetsumetsu Kurokami Shoujo. It was this song, Seishun no Laptime. It was a B-side in Zetsumetsu...but even before that, NMB were already performing seishun no laptime in theatre. Since it's their first song, they kinda perform it everywhereee lol. It's a very important song for them, and it's perfect for all their energy and high stamina haha. Idk if you know it...but it might be something you may fancy? I do quite like it. I think the dance is quite unique...lol. NMB has quite a unique flair to their dance sometimes. I don't quite know how to explain it haha. It's also the OP to NMB's comedy series that has already ended btw, Geinin!! 2 lol. Ooops sorry I think that Jpopsuki link for Boku ga mou sukoshi daitan nara is probably not working.